The recently published 18th Edition regulations, stating that cables must be supported against their premature collapse in the event of ﬁre, has many electricians asking ‘why?’ and ‘how?’ Here the experts at D-Line provide the answers. Can you summarise the background to this new requirement? Of the 12 ﬁreﬁghters killed at work between 2005 and 2015 in the UK, two-thirds were victims of fatal cable entanglements – those deaths wouldn’t have occurred if cables had been supported with ﬁre safety in mind. Coroners’ reports describe the horriﬁc consequences of cable entanglements. 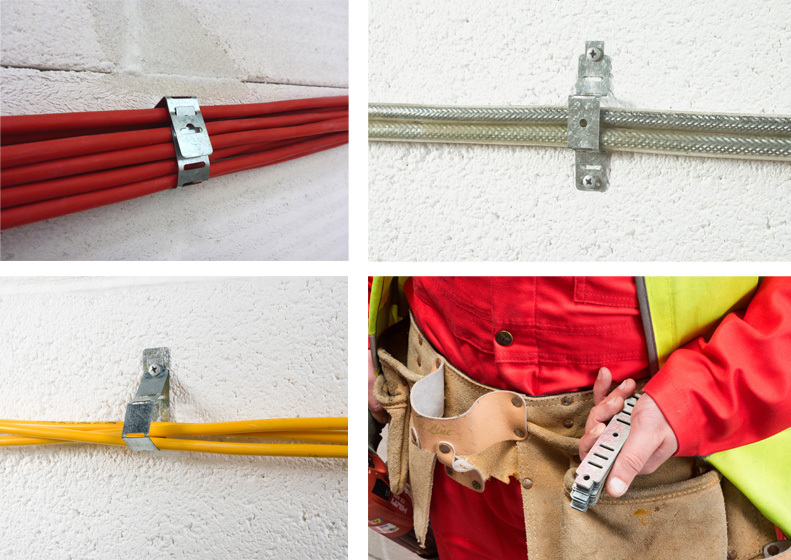 In July 2015 an amendment to the 17th Edition required non-combustible ﬁxings to be used for all new surface cable installations on ‘escape routes’. Because ﬁres can occur anywhere the 18th Edition has extended the requirement to all new cable installations… a potential life-saving development. Must all new cable installations be secured in non-combustible ways? Yes. Steel ﬁxings and containment-systems can typically withstand temperatures exceeding 1,000ºC for at least two hours; intended to afford sufficient time to evacuate densely populated buildings. Installations relying on common plastics will melt at approximately 150ºC. In ﬁres, PVC wall-plugs, plastic clips and ties, and plastic cleats ﬁtted direct-to-surface, can all cause cables to drop by offering inadequate support. Similarly, every length of surface-mounted PVC trunking and conduits needs to be secured by non-combustible ﬁxings, so the cables will remain in-situ long after they disintegrate. Are all metallic clips suitable for use? Not necessarily. While mild-steel is suitable, almost half of metals will melt at lower than 500ºC. British ﬁre-test labs test ﬁxings up to 970ºC for two hours, applying vibrations to installations and water sprays too, to simulate ﬁre conditions in accordance with BS5839pt1 benchmark. For peace-of-mind and to ensure ﬁt-for-purpose, stakeholders should beware of untested products and alloys of variable compositions from batch productions that can offer no performance guarantees. Aside the heightened awareness of ﬁre-safety generally, at D-Line we believe that a legacy of the lives lost should be that standards are at least respected. How should non-combustible ﬁxings be installed? Cables should be secured in accordance with cable manufacturer’s guidelines. For horizontal cable installations the rule-of-thumb is generally 300mm spacings for cables up to 8mm diameter, and 400mm for vertical installations. Bigger cables can sometimes be spaced wider. It’s important to note that wider-than-recommended spacings compromise cable integrity, and cable performance is fundamental to the regulations. From specially commissioned testing we know D-Line Safe-D products can be fully-loaded re cable weight, and spaced on both walls and ceiling planes at 500mm centres, while still holding cables securely. However tempting, the wider spacings can increase risk of cables sagging, which over the time of a ﬁre increases risk of short-circuits, when power to alarms and lights might be critical. Consideration must be given not only to surface clip capabilities, and for due diligence only ﬁre-tested certiﬁed ﬁxings should be used as part of a complementary ﬁre-rated cable management ‘system’. Are such ﬁre-rated cable management systems available? 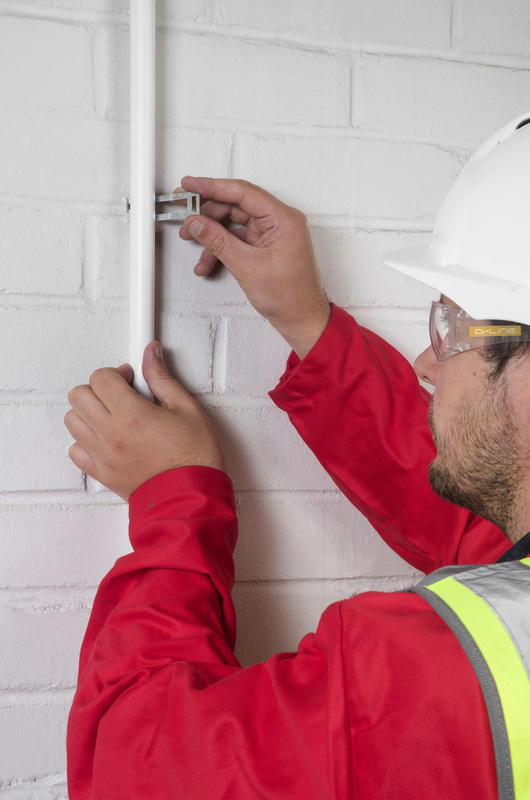 D-Line offers a full range of innovative solutions that are fully tested for compliance with BS5839pt1 and to satisfy new 18th Edition regulations, in conjunction with D-ﬁxing screws. These screws have subtly-domed heads that optimize space within the Safe-D Clips, and 40mm length that embeds to offer exceptional pull-load resistance and load-bearing. D-Line’s range is ideal for direct-to-surface ﬁxing or for installation in pvc trunkings up to 50mm wide. All are user-friendly and exceptionally quick-to-install.